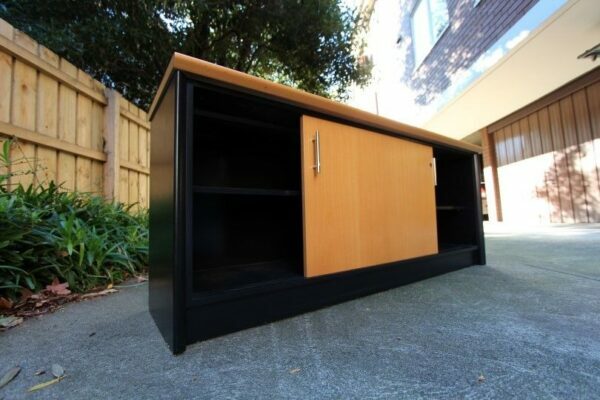 Long heavy high quality office cabinet with with modern stainless steel handle sliding doors. Low cupboard / credenza / office buffet. Huge storage capacity. Birch timber-look laminate top and black sides and shelves. This item could be used as a lowline TV entertainment unit too! Usual to mild wear and tear. Change the colour by painting. Movable by trailer or large van. Ideal to support a large TV. Staff onsite 24/7 arrange inspection anytime. Cash Credit or debit card (Mastercard, Visa, Amex). ~ LOT SET Single Bed and Mattress. With Drawers!